In most areas of my life, I prefer the digital. Digital photos. Digital scrapbooks. Electronic communication. I love it all. But to get me through the day, I can’t function without my lists. I start each morning by unloading my brain in list form of everything I need to do. And I mean everything. If I have to make a few phone calls, I break it down and list every person, place or thing I need to call that day. If it’s my goal to do “some laundry”, I write down exactly how many loads I plan to wash, dry, fold and put away. Why? Well, because of the joy of crossing off each item when I’m done, of course! I am so glad that I have discovered MANY of my mom friends are like me! We love lists to keep our day on course. And we even write down items that have already been completed just so we can cross them off (or use our pretty highlighters, in some cases). 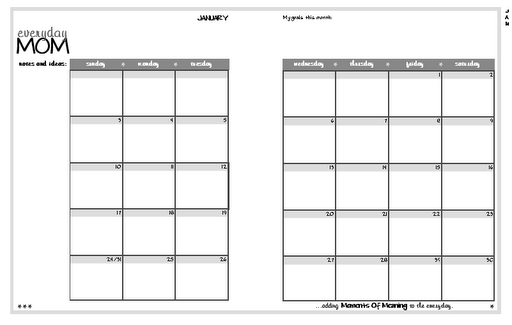 So, for all of my like-minded friends, you will be happy to know I have FINALLY completed my 2010 everydayMOM planner! I have a bunch in stock right now, which I am selling at a reduced price of $15 (no tax or shipping charges if you are local). Click here for ALL the details on how to order and to see a preview at my online store. If you haven’t used my planner before, put it on your Christmas list! 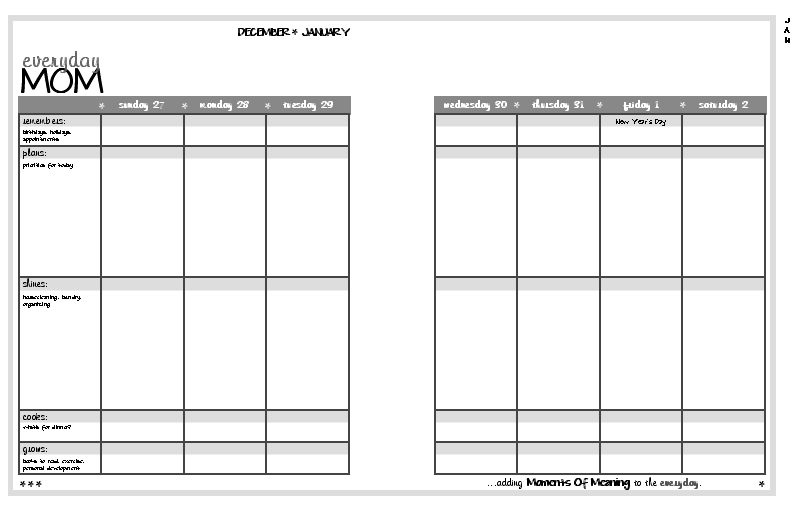 Each month starts with a two-page layout so you can see your whole month at a glance and write down your big -picture goals. your plan for your personal growth (maybe it’s reading, Bible study or excercise). Even my kids have their own planners this year. It is amazing each day to hear them call out, “Has anyone seen my planner?” They get us all through the day with a little more sanity. When I can’t find mine, I’m a mess. I need my lists. They work for me, which is why I’m linking this post to Works For Me Wednesday this week. What works for you to keep your life organized?